After a few days playing at Colt Seavers in Tricentrol's remarkable little turbocharged Fiesta, I really thought there was something wrong with my AR3. Like a sticking throttle perhaps, or maybe a loose plug lead or similar power-sapping fault. In fact, it transpired that all it was suffering from was a nasty attack of contrast, and any small-to-medium sized sports hatchback is going to come off worst in the performance stakes when comparison is made against the Lumo 105T Fiesta. Indeed, in terms of price and performance the little beastie is nothign short of an embarrassment to a lot of cars that should know better. 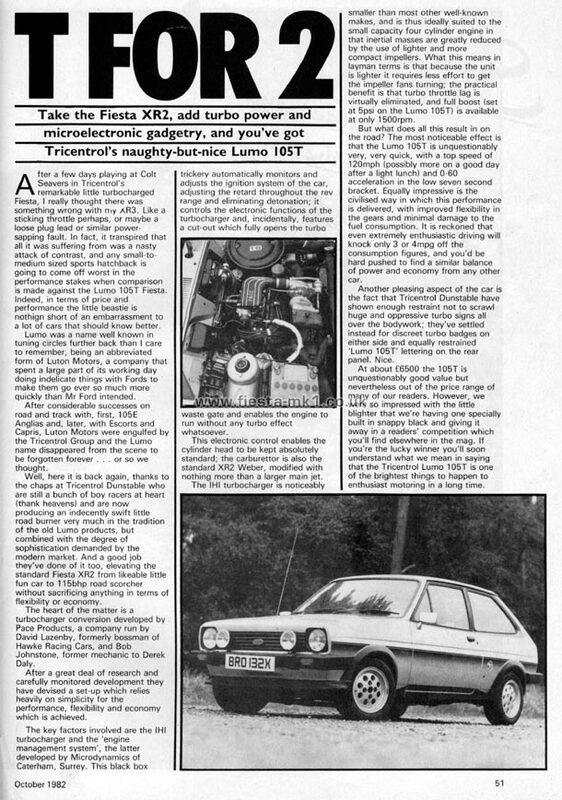 Lumo was a name well known in tuning circles further back than I care to remember, being an abbreviated form of Luton Motors, a company that spent a large part of its working day doing indelicate things with Fords to make them go ever so much more quickly than Mr Ford intended. After considerable successes on road and track with, first, 105E Anglias and, later, with Escorts and Capris, Luton Motors were engulfed by the Tricentrol Group and the Lumo name disappeared from the scene to be forgotten forever ... or so we thought. Well, here it is back again, thanks to the chaps at Tricentrol Dunstable who are still a bunch of boy racers at heart (thank heavens) and are now producing an indecently swift little road burner very much in the tradition of the old Lumo products, but combined with the degree of sophistication demanded by the modern market. And a good job they've done of it too, elevating the standard Fiesta XR2 from likeable little fun car to 115bhp road scorcher without sacrificing anything in terms of flexibility or economy. The heart of the matter is a turbocharger conversion developed by Pace Products, a company run by David Lazenby, formerly bossman of Hawke Racing Cars, and Bob Johnstone, former mechanic to Derek Daly. After a great deal of research and carefully monitored development they have devised a set-up which relies heavily on simplicity for the performance, flexibility and economy which is achieved. The key factors involved are the IHI turbocharger and the 'engine management system', the latter developed by Microdynamics of Caterham, Surrey. This black box trickery automatically monitors and adjusts the ignition system of the car, adjusting the retard throughout the rev range and eliminating detonation; it controls the electronic functions of the turbocharger and, incidentally, features a cut-out which fully opens the turbo waste gate and enables the engine to run without any turbo effect whatsoever. This electronic control enables the cylinder head to be kept absolutely standard; the carburettor is also the standard XR2 Weber, modified with nothing more than a larger main jet. The IHI turbocharger is noticeably smaller than most other well-known makes, and is thus ideally suited to the small capacity four cylinder engine in that inertial masses are greatly reduced by the use of lighter and more compact impellers. What this means in layman terms is that because the unit is lighter it requires less effort to get the impeller fans turning; the practical benefit is that turbo throttle lag is virtually eliminated, and full boost (set at 5psi on the Lumo 105T) is available at only 1500rpm. But what does all this result in on the road? The most noticeable effect is that the Lumo 105T is unquestionably very, very quick, with a top speed of 120mph (possibly more on a good day after a light lunch) and 0-60 acceleration in the low seven second bracket. Equally impressive is the civilised way in which this performance is delivered, with improved flexibility in the gears and minimal damage to the fuel consumption. It is reckoned that even extremely enthusiastic driving will knock only 3 or 4mpg off the consumption figures, and you'd be hard pushed to find a similar balance of power and economy from any other car. Another pleasing aspect of the car is the fact that Tricentrol Dunstable have shown enough restraint not to scrawl huge and oppressive turbo signs all over the bodywork; they've settled instead for discreet turbo badges on either side and equally restrained 'Lumo 105T' lettering on the rear panel. Nice. At about £6500 the 105T is unquestionably good value but nevertheless out of the price range of many of our readers. However, we were so impressed with the little blighter that we're having one specially built in snappy black and giving it away in a readers' competition which you'll find elsewhere in the mag. If you're the lucky winner you'll soon understand what we mean in saying that the Tricentrol Lumo 105T is one of the brightest things to happen to enthusiast motoring in a long time.